Ronald Brooks Kitaj, painter and print maker, born in Cleveland, Ohio, USA. He studied at the Cooper Union Institute in New York in 1950-2; the Academy of Fine Art, Vienna in 1951; at the Ruskin School in Oxford in 1958-9 and at the Royal College of Art from 1959 to 1961. At the Royal College he met David Hockney, who became a close friend. After his studies, Kitaj settled in England and through the 1960s taught at various art colleges. These included Ealing Art College, Camberwell School of Art and the Slade School of Art. His first solo exhibition was at Marlborough New London Gallery in London in 1963, entitled “Pictures with commentary, Pictures without commentary“. After a brief time in the USA teaching at the University of California Berkeley in 1967-8 and at the University of California Los Angeles in 1970-1,he returned to London. 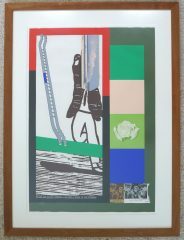 In 1976 Kitaj was selected by the Arts Council of Great Britain for an exhibition called The Human Clay. The show included works b British artists including Bacon, Freud, Auerbach, Kossoff, Moore, Hodgkin and Hockney. Kitaj’s essay for the catalogue, he proposed the idea of a School of London, which became one of the key art historical texts of the period. In 1989 he published the First Diasporist Manifesto, the longest and most impassioned of his many texts discussing the Jewish dimension in his art and thought. His various honours include election to the American Academy of Arts and Letters in 1982. In 1985 he became the first American since Sargent to be elected to the Royal Academy. Numerous retrospective exhibitions of his work have been held, including shows at the Hirshhorn Museum, Washington, DC and tour 1981-2; and the Tate Gallery, Los Angeles County Museum of Art and Metropolitan Museum of Art, New York 1994-5. He moved to Los Angeles in 1997 to live near his sons.